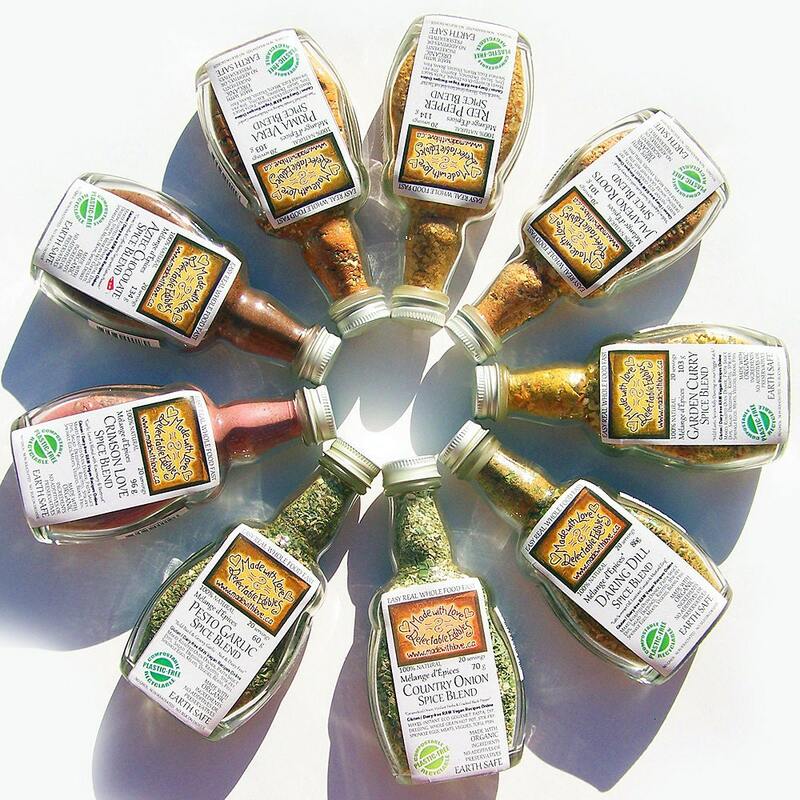 All nine fabulous Made with Love Artisan Spice Blends in 4.5 oz medi-size glass bottles, mailed to you, one every month for 9 months! An eco gourmet gift for you & the ones you love, our planet included. The Perfect Edible Gift for your Valentine! Remind your loved ones that you are thinking of them with a little LOVE every month! OR Share the LOVE. Buy 1 set for yourself & 1 for a good friend or sibling...then start a Easy Real Whole Food Fast Cooking Club and share recipes!!! The perfect gourmet gift for your partner - reap the benefits of delicious dinners all year long! A thoughtful edible gift that keeps on giving! Pay in full at check out or choose "other", submit your credit card info and we will bill your credit card only $18/month in Canada with all shipping included - $20/month in US or $23 /month everywhere else (phone us or enclose your credit card number and expiry date in notes with purchase). "These spices are fantastic and so is the customer service. We will certainly order again!" "Tasty as always, thank you guys so much!" "Good quality, beautiful meals! thanks!" "My sister...received your care package today and felt the love... your thoughtful packaging and the handwritten version of my gift message was unexpected and touching. I am now a devoted fan. Thank you for what you do. Best wishes for your success"
Made with Love Artisan Spice Blends Master the Art of Simple Gourmet Cooking! Use our "Simple Seven Recipes" to make Magic Meals in minutes. Gourmet Pasta & Sauce - Creamy or Clear - regular or gluten free! & more, all from scratch! Just add a few fresh ingredients & Voila! Tell all your friends " I made it myself - it's Made with Love". Sprinkle on soups, salad, veggies, chicken, meat, fish, tofu, eggs, potatoes, sauces, pasta, pizza, bread, chili or on the barbeque as a BBQ grill rub all summer long! Feed yourself and your loved ones very well, while simultaneously nourishing self with calm simplicity and ease. Easy Real Whole Food Fast! Made with Love Dips are incredible: just mix 2 Tbsp with one cup of Mediteranean or Greek Yogurt for knock your socks off super yummy dip with all the taste of a sour cream and none of the guilt. OR choose 1 cup of sour cream and mayo as your base, OR creamcheese OR hummus, OR our tofu and nayo vegan base from our website. All nine of our Spice Blends are spectacular dip mix. Each Medi size 4.5oz /5 recipe bottle will make 20 generous, "10 minute" pasta bowl dinners with a rich gorgeous real cream sauce (dairy or coconut) or a decadently divine clear sauce... with generous Big Bowl servings like real people eat! Gluten-free, Vegan, Raw and Dairy-free recipe options provided. Garden Curry is a mild curry blend with a sweet mix of garden vegetables; fabulous in a whole grain hot pot, stirfry or soup. In creamcheese, pasta or yogurt dip it creates a mild, rich & flavourful sunshine cream! Add to your rice or quinoa, soups, stirfry and lovely with chicken, eggs or fish. One of our most popular Spice Blends, One of our most popular Spice Blends, Garden Curry appeals to all taste buds, even many who believe they don't like curries. Made with Love Garden Curry has spiced up many previously "curry-free" relationships! Country Onion is a traditional mix of fresh sun dried garden herbs, caramelized onions and chives, finished with cracked black pepper and natural unrefined Antarctic sea salt. An extremely versatile blend, spectacular on poultry or eggs, fabulous for potatoes and herbed rice. Love it for savoury herb biscuits, a classic dip mix, buttermilk ranch style dressing and in creamcheese on a bagel. A "have to" for mixing into your burgers or meat loaf or rub on your meats for the grill. The hands down BEST Turkey Spice Blend for Sprinkling on organic chicken or turkey or for mixing in your turkey stuffing mix! Use it to spice up vegan roasts and lend a little traditional holiday flavour for your meat free friends! INGREDIENTS: dried: herbs & spices, onion, unbleached raw turbinado sugar & natural sea salt. Pesto Garlic is our #1 Best Seller - our sun dried rendition of its namesake. Not fresh pesto but an easy instant version that is extremely versatile. No pinenuts or cheese here so safe for vegans or nut-free, just a beautiful blend of garlic and the fresh herb flavours traditionally recognised as pesto. Great for pasta, meats, salads or dip mix. Excellent on roast chicken, grilled veggies, in soups or on fish. "Late Summer Dill with Luscious Tomato & a Mustard Zing" Daring Dill is truly our most sophisticated Blend. Gorgeous dressings, perfect seafood, savory sauces full of great dill flavour balanced by a hint of fresh sun dried tomato and a hot mustard finish. Lovely on veggies, chicken or fish. Excellent for vinaigrette dressings and creamy sauces. A must have for scrambled eggs, on boiled new potatoes, asparagus or green beans. Our Daring Dill Dip Mix is truly Delightful!